Young Ave. Heritage Conservation Society. Formed to promote the historical importance of Young Avenue in Halifax, its association with provincial legislation of the day, international planning movements, its early residents (politicians, judges, business/government/university leaders, and leading philanthropists), its diverse architecture, and its place in the development of the city during a period of economic upturn in the late 1800s. Public Meeting: Young Ave Zoning Amendments Nov 2. Located on the Corner of Inglis St and Young Ave. in the south End, this house has some significant history. The House was designed by J.C. Dumaresq, in 1902 for George Wright. 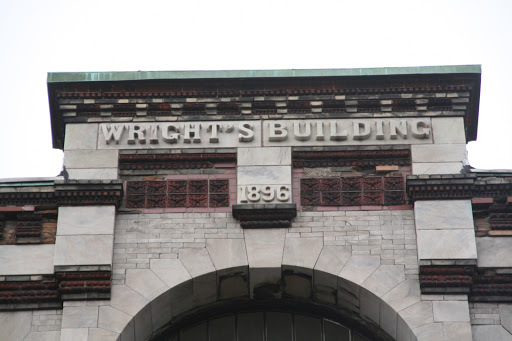 (Note that this will not be the last time we hear of this Client/Architect relationship)Wright himself Was quite wealthy, owning both the St. Paul’s Building and Wright Building on Barrington street. Wright Ave. (Off Morris, East of South Park St. is Named for him. It was also the location of a series of working class Duplexes, built behind more elaborate mansions fronting South Park St, which were also commissioned by Wright. Wright was also a supported of the temperance movement, and financially supported many local charities. 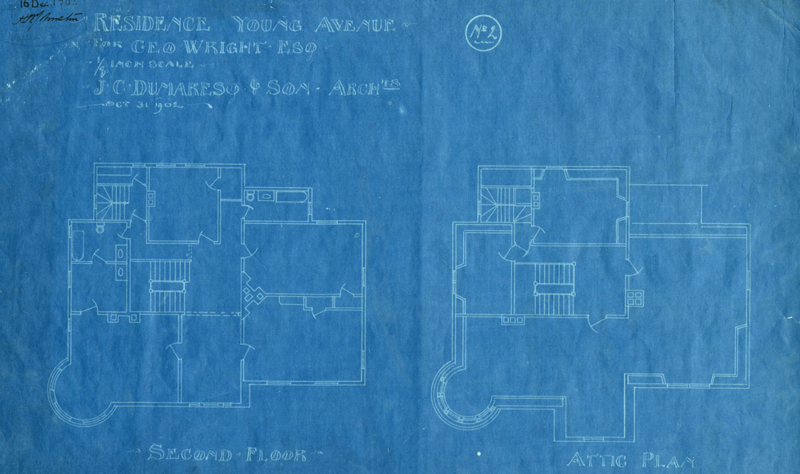 Despite his prolific Building program, George Wright is probably best remembered not for how he lived, or what he built, but for how he died. Wright was a traveler, and was unfortunate to be Booked for passage on the Maden voyage of the Titanic. His body was never recovered. He left the House to one of the Charitable causes he supported, the Woman’s Council of Halifax, Who continue to own the building today. Dumaresq chose to design the home in the eclectic Queen Anne Revival Style. The Queen Anne Revival is from the late Victorian era, and was most popular between 1890 and 1914. The Style generally feature asymmetrical facades, steeply-pitched and irregular rooflines, front-facing gables, overhanging eaves, circular or square towers with turrets in corners, unusual windows, wraparound verandas, highly ornamented spindles, and bright colours. Most of these details can be seen in George Wright House. 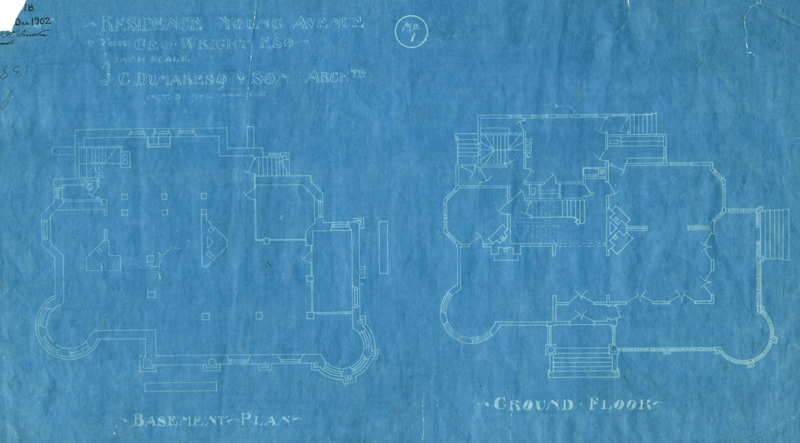 The plans and Elevations (above) Are Held by the NS Archives. 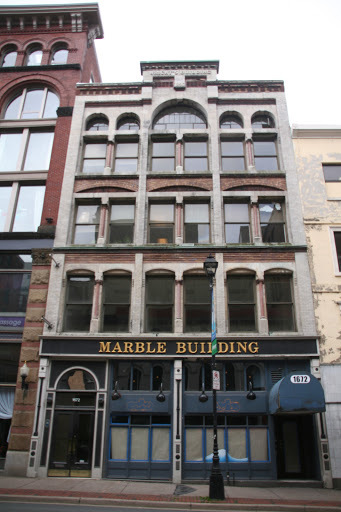 Among the Other projects completed by Wright with Dumaresq as architect is the Marble Building on Barrington Street. Owned By Gerorge Wright and Designed By J.C Dumaresq, Wright’s Building or the Marble building as its now known was built in 1896. Built in the Chicago Style, to compliment the Nova Scotia Furnishings building next door.The facade consists of Red and Grey brick, with Terracotta accents. 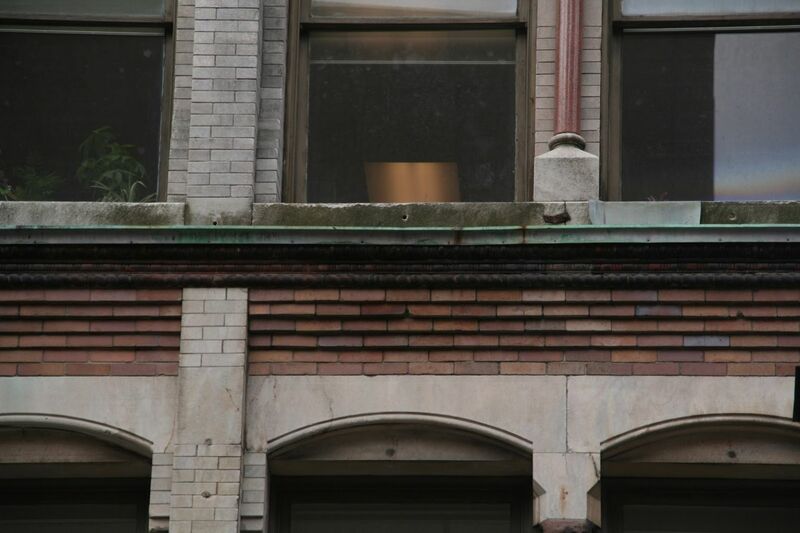 Window pairs are separated by Red Marble Columns, Which are responsible for the building taking the “Marble building” name. (Above) Wright’s Building 1896 show use of Red and grey brick with terracotta. The Owners name emblazoned on top. (below) Detail between stories. For 4 years this Building Housed a Marconi Wireless station. in 1896, like today, The latest and most modern buildings attract the most modern clients..
Young Ave. Protections In the City Charter. The city charter was in effect until amalgamation, when it was replaced by the Halifax Regional Municipality act in 1996. that act was then replaced by the Municipal Government Act in 1999. the HRM Charter was then enacted in 2008 to give the city more flexibility then it had under the MGA. This may suggest that the protections for young Ave were left out at amalgamation, Not in the 70’s as suggested. I will attempt to verify by locating a 1996 copy of the city charter for reference. 816 Except as herein otherwise provided no Young Avenue – only residential premises situated on any part of young Avenue or in the Miller property as hereinafter defined, shall be used for any purpose other than a private residence but any building now erected on Young Avenue or in the Miller property as hereinafter defined may be altered for use as an apartment house, and, when so altered, used for that purpose, provided that such building when so altered shall not contain more than four apartments exclusive of caretaker’s quarters. 1938, c. 58, s. 25; 1939, c. 65, s. 22. 817 No person shall erect any building on Young Avenue, or within one hundred and eighty feet thereof,without first submitting to the inspector the plans and specifications thereof in duplicate, including a statement of the materials of which it is proposed to construct such building, together with an estimate of the cost of the building and a declaration of the purpose for which the building is intended to be used, and the inspector shall refuse to approve of such building if the same does not conform to the requirements of a building on Young Avenue as herein specified. C. C., s. 836. (c) the design and appearance is not in the opinion of the inspector suitable to a building to be erected on the said avenue.buildings. ( d) Notwithstanding the provisions of the preceding clauses of this section, the Inspector may permit the wooden building situated in the rear of the dwelling now known as Number 153 Young Avenue and upon the same lot of land partially occupied by such dwelling to be converted into a private residence,provided that such building when so converted shall not be of less value than Four Thousand Dollars, that the plans for such conversion be approved by the Inspector and that any alteration to such building shall be done in accordance with the provisions of the Charter relating thereto. When such building is so converted the Inspector may approve of the same. ( 2) If the inspector refuses to approve of any building which otherwise conforms to the requirements of this Act in respect to a building on Young Avenue solely on the ground that it is not suitable in design and appearance, an appeal shall lie from his refusal to the Council,which may approve of the building. (3) The approval of the inspector shall be endorsed upon the plans and specifications, and a copy of the same shall be retained by him. (4) If a proposed building is approved by the Council on appeal from the refusal of the inspector to approve of the same, a memorandum of such approval shall be endorsed on the plans and specifications, and a copy of the plans and specifications retained by the inspector.C. C., S.S. 837, 838, 839; 1943, C. 48, S. 1. 820 No building at any time erected on Young Avenue, within one hundred and eighty feet thereof, shall be used as a shop, hotel, house of entertainment, boarding-house, livery stable, garage, or for any purpose other than a private dwelling house, or private stable or garage in connection therewith but any building now erected on Young Avenue or within one hundred and eighty feet thereof, may be altered for use as an apartment house, and, when so altered, used for that purpose, provided that such building, when so altered, shall not contain more than four apartments, exclusive of caretaker’s quarters.c. c., s. 841; 1938, c. 58, s. 26; 1949, c. 70, $. 27; 1950, c. 66, s.39. 821 (1.) On the part of Young Avenue lying to the south of a point on the east side of said avenue one hundred and sixty-nine feet south of Inglis Street, and of a point on the west side of said avenue four hundred and three feet six inches south of Inglis Street, no building shall be erected the main portion of which is nearer to the side line of the avenue than forty feet, and no veranda, portico, porch, stoop steps or other appurtenances to any such building shall be at a less distance from such side line than twenty-five feet. (2.) On the remaining portion of the said avenue, no building shall be erected any part of which is at a less distance than twelve feet from the side line of such avenue. C. C., s.842. 822 No building shall at any time be erected on any lot having a frontage on any street, other than young Avenue, extending through the said Miller property at a less distance than ten feet from the street. C. C., s. 843. Heritage Application for 825 Young Ave.
Below is the Heritage registration submission for 825 Young Ave by Young Avenue District Heritage Conservation Society/Save Young Avenue. The Property is Well Documented, and the Submission is well researched. It is very likely that the Staff report will recommend registration. (Assuming the building is still Standing) This was posted to the Save Young Ave. Facebook page. This memo to the Heritage planning staff, city council and Heritage Advisory Committee urgently requests that the city take immediate action to carry out a Heritage Registration of an important Heritage property at 825 Young Avenue. The house on this property dates to 1902 and has many important historical connections. This house is now threatened with demolition and proposed infill with a subdivision, which, if successful, will obliterate all evidence of the history of this property, joining the fate of its adjacent neighbor at 851 Young Avenue which was recently demolished, and further eroding the fabric of this historic streetscape. 1. The architect (Edmund Burke, in partnership with JCB Horwood). Architect Edmund Burke was one of Canada’s pre-eminent architects. He designed such Toronto landmarks as the Simpson department store (1st curtain wall construction in Canada), Jarvis Street Baptist Church, the Bloor Street Viaduct and McMaster Hall (now Royal Conservatory of Music) among many others. He was one of the three founding members of the Royal Architecture Institute of Canada. Burke proposed the resolution that established the Ontario Association of Architects in 1889, which he later led as its president in 1894 and 1905-1907. His domestic works often drew upon the ideas of British architect Richard Norman Shaw, designed to conserve heat and oriented to catch sunlight, with an air of serenity and quiet homely charm. Burke introduced to the practice of architecture in Canada new vocabularies and technologies then current in the United States. Burke’s partner, J.C.B. Horwood was born in Quidi Vidi, Newfoundland. He trained at the architectural firms of Langley, Langley and Burke, in Toronto (from 1882 to 1887) and Clinton and Russell in New York City (1889-1894). Horwood strongly associated himself with the Arts and Crafts movement in the late 1890s, and this was reflected in many residential commissions. He partnered with Edmund Burke in 1894. Well known for the Chicago style steel-frame construction and fire-proof materials they adopted for large commercial buildings, Burke and Horwood’s projects included office buildings, retail stores, sanatoria and residences in Toronto’s affluent Rosedale area. Major projects included various Toronto Baptist and Methodist churches, the Toronto West-end and Central YMCA buildings, various Hudson Bay Company department stores throughout Canada, as well as additions to Osgoode Hall and renovation of the Robert Simpson Company department store in Toronto. 2. The original owner. George S. Campbell was born in Edinburgh in 1851 and educated at Edinburgh Scotland, the youngest son of Duncan Campbell, the journalist and historian who wrote the History of Nova Scotia and the History of Prince Edward Island. Campbell was brought up in Halifax and eventually went into shipping. In June 1857 he married Helen Kennedy daughter of David Kennedy of Edinburgh Scotland. George Campbell owned GS Campbell & Co, Steamship agents, the Halifax Tow Boat Co, and Halifax Salvage Association. He was Chairman, Point Pleasant Park and President, Halifax Board of Trade (1901-1902). He was also Director of Eastern Trust, Director of Nova Scotia Steel and Coal Company, and Director (1899-1927) and President, (1923-1927) Bank of Nova Scotia. Campbell was Governor, and then Chairman, Dalhousie Board of Governors, 1908-1927. Campbell oversaw the purchase of Studley Campus, and hired renowned Toronto architect Frank Darling and well-known local architect Andrew Cobb to design some of the first buildings on the new campus. As well, Campbell was influential in persuading the Dalhousie board to take over the Halifax Medical College and the creation of Dalhousie’s Medical Faculty in 1911. Campbell did much to forge links between Dalhousie and the city. His presence as such an active working chairman attracted others. Campbell negotiated a deal with R.B. Bennett’s law firm (Bennett eventually became prime minister of Canada), to buy and convert E. P. Allison’s mansion on Oxford Street in Halifax to become Dalhousie University’s president’s home which remains today. During WWI he acted as Chairman of the Patriotic Fund for the Province, providing funds for the care of dependants of those on the firing line (his son was killed in action). Campbell died suddenly of a heart attack on November 21, 1927 at the age of seventy-six, still president of the Bank of Nova Scotia, and still chairman of the Dalhousie board. His passing resulted in an outpouring of tributes for his life and contributions. 3. Subsequent owners. The house remained in the Campbell family until the death of his wife, Helen Kennedy Campbell, in 1941. It was inherited by Margaret William (later Dawson). It was then leased to the Navy League of Canada as the Naval Officers Club. 47,115 naval officers visited the club and 29,704 meals were served there. Margaret Dawson converted it to 5 rental units after the war. The property was acquired by the Fram family in 1961. 2. 1896 Provincial Young Avenue Legislation. 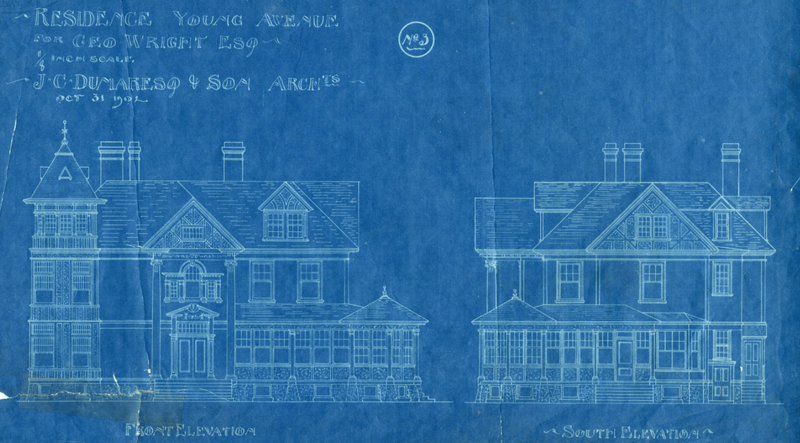 This legislation was intended to define and strengthen the beauty and grandeur of Young Avenue, as the main entrance to Point Pleasant Park, and restrictions were placed on minimum value of houses to be built, as well as set back from the street (40 feet), and how close non-compatible construction could be built (180 feet). Architectural Style. This home at 825 Young Avenue is a major contributor to the overall composition and ambiance of the street. Along with other original grand homes, Young Avenue provides a variety of styles and diversity of monumental homes not found elsewhere in the city on a boulevard of this nature. The George S. Campbell House at 825 Young Avenue is an eclectic amalgam of American Shingle style and Arts and Crafts style, with some Queen Anne elements, also in vogue at the time. 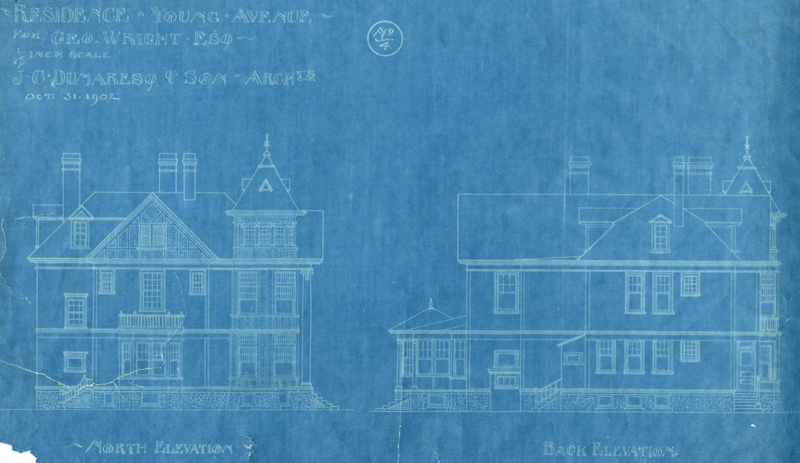 As noted in Wikipedia: “The Shingle style is an American architectural style made popular by the rise of the New England school of architecture, which eschewed the highly ornamented patterns of the Eastlake style in Queen Anne architecture. In the Shingle style, English influence was combined with the renewed interest in Colonial American architecture which followed the 1876 celebration of the Centennial. The plain, shingled surfaces of colonial buildings were adopted, and their massing emulated. Aside from being a style of design, the style also conveyed a sense of the house as continuous volume. This effect of the building as an envelope of space, rather than a great mass, was enhanced by the visual tautness of the flat shingled surfaces…and the emphasis on horizontal continuity, both in exterior details and in the flow of spaces within the houses”. It incorporates Arts and Crafts elements both inside and out: natural materials such as stone and wood, thick and squared porches, exposed beams in the living room, and brackets and timber detailing under exterior porches and gables, a single broad gable with elongated bays, lines of horizontal delineation, and its foundation anchored to, and an extension of the ground. -Numerous and varied window details: A window to the left side of the door has nine panes while the bay window on the right features eight-over-one windows flanking a single ten-over-one window. To the right of the first floor a three-sided bay window mimicking the bay window on the second level. There is a single window with vintage leaded Harlequin glass to the right of the ground level bay. The second floor has a single eight-over-eight window above the front entry and a three-sided bay window with two eight-over-one windows on each side of a single ten-over-one window. The third floor windows are divided into thirds featuring six-over-one panes under an overhang. -Current rear lot line (185′) corresponds well with dimensional restrictions outlined in the 1896 provincial legislation. Architectural details: Attached are photographs showing some of the architectural details, character defining elements, and historic photographs. Site plan: Attached, including legal description. As per HRM Heritage By-law H-200, and the Heritage Property Act, we ask that you take necessary steps to table this request with the HAC at its next meeting on July 27, and that you seek council direction to prioritize and expedite your review of this endangered property, and that you further seek HAC approval of this application so that council may then serve (Form A) notice on the registered owner of the committee’s recommendation, thereby preventing demolition, pending council’s final decision. It is understood the current owner, in conjunction with a developer, has a demolition permit to destroy this majestic home, which has significant historical connections and is part of a diminishing stock of important architecture, on Young Avenue. So that the intent of the original designers and legislators who created Young Avenue will continue to be respected, these properties need protection. The adjacent historic property at 851 Young Avenue was recently demolished by the same developer, at the same time an application for registration was under review by the city. Any further losses cannot be sustained. As a result of the loss of 851 Young Avenue, a recent motion was passed at council (May 10, 2016): “THAT Halifax Regional Council request a staff report recommending best options to establish protections to the heritage and character of historic Young Avenue, including but not limited to: 1. Changes to the Land Use By-law related to lots size, coverage, frontage and dwelling count 2. Establishing a Heritage Conservation District or Heritage Streetscape. MOTION PUT AND PASSED UNANIMOUSLY”. The pending demolition of this historic building, unless stopped, will be a significant blow to conservation efforts, and contrary to the spirit of the recent motion. The Young Avenue District Heritage Conservation Society wishes to work with the municipality to establish this area as a cultural landscape/streetscape worthy of protection, consistent with the objectives of Chapter 7 of HRM Planning Strategy, recent amendments to the Heritage Property Act, and the City Centre Plan, but because of the imminent and very real risk to this property and the streetscape, this application needs to be processed with the utmost urgency. The Scotiabank Story: A History of the Bank of Nova Scotia 1832-1982 by Joseph Schull and J. The houses along Young Avenue are at risk. Dino Capital Ltd. is purchasing them, demolishing them, and consolidating lots. Young Avenue is a treed boulevard leading to Point Pleasant Park. Since the street was built, it was intended to be a grand entrance to the park, lined by large homes. The street was one of the first City Beautiful projects in the city, and in 1896 the street was protected by “An Act Relating to Young Avenue in the City of Halifax,” passed by the provincial legislature. The provisions of the Act were moved to the City Charter in 1907, but were removed in the ’60s. Currently only two properties on the street are registered Heritage Properties; George Wright House at 989 Young Ave. and the Admirals House at 770 Young Ave.
851 Young ave was demolished before it could be registered, however the report suggests it was significant enough to warrant registration. The same developer that removed 851, has now begun demolishing 825 Young Ave, Also known as the Fram House, despite tenants still living there on current valid leases. Council was requested by the Heritage Advisory Committee to fast-track the application process, however the vote to do so was lost 10-6 in part due to the damage caused by the developer, and apparently the city is of the opinion that heritage status does not revoke already issued demolition permits, since The Heritage Act doesn’t say that happens. Since the Heritage Act requires approval of council for a heritage demolition, and the as-of-right permit issued doesn’t have council approval, it is not valid if the heritage status is granted. The Heritage Act clearly requires council approval of demolitions, and has no exemptions or grandfather clauses for already issued permits. Adams, Walker, Rankin, Johns, Craig, Mosher, Dalyrmple, Karsten, McCluskey, Mancini were the votes to not fast track the process. Once again, this appears to be a case of planning decisions made in the ’60s coming back to haunt us.